I don’t know that I’ve ever heard my son Henry say, “Mom, will you make this again sometime?” because I don’t know that he’s ever enjoyed a dinner meal enough to say this. So, I was shocked at this declaration last week when I made these meatballs. He, and all my other kids, really loved them. Loved them as in ate-them-all-and-asked-for-more loved them. I couldn’t believe it. Happily, my hubby and I loved them, too. This recipe comes from Saveur magazine, November 2012. 1. Prepare the sauce: In a large Dutch oven, heat the oil, then sauté the minced onion over medium heat until tender and golden, 8 to 10 minutes. Add the tomato sauce, and rinse out the can with ½ cup water to loosen any sauce that remains, adding that liquid to the pan. Stir in the sour salt or lemon juice and brown sugar. Bring to a simmer, uncovered, over medium heat. Remove from the heat and set aside. 2. Make the meatballs: Put the ground meat in a large bowl and push it to one side. Add the eggs, rice, bread crumbs, onion, salt, and pepper to the other side of the bowl and combine with a large fork. Work in the meat, handful by handful, until everything is thoroughly blended. Return the sauce to a gentle simmer over medium heat. 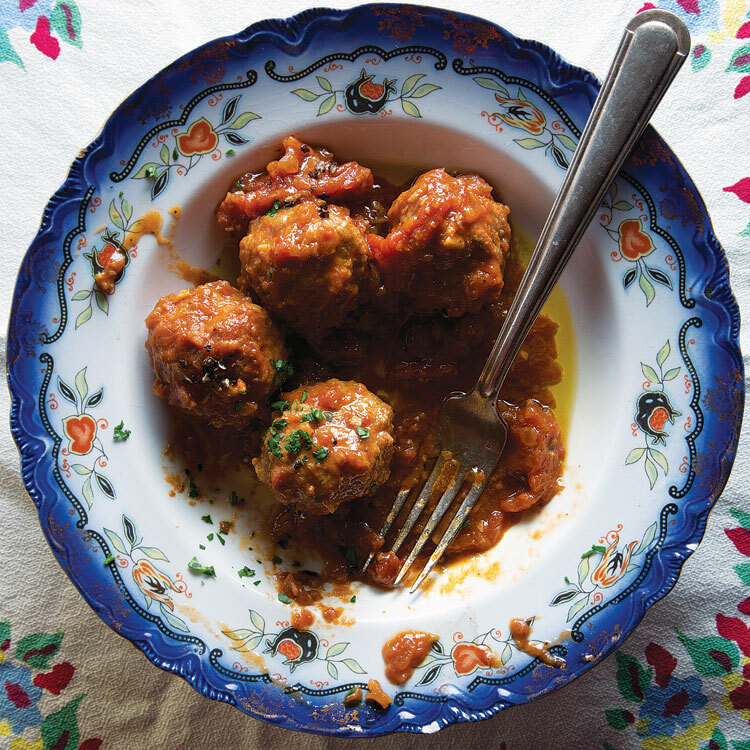 Using a ½-cup measuring cup, shape meatballs measuring about 2½” and drop them gently into the sauce. You should have 10 to 12. Cover and simmer slowly for 30 minutes, gently rotating and pushing the meatballs around halfway through the cooking so that they are thoroughly coated in sauce after about 15 minutes. Correct seasoning with salt and pepper if necessary. Serve very hot.